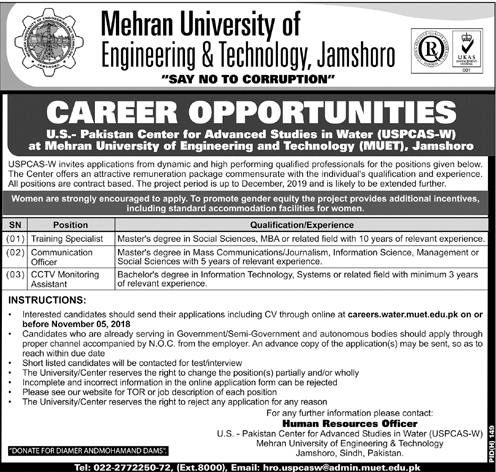 Mehran University of Engineering & Technology Jamshoro Sindh. Interested candidates should send their applications including CV through online at career.water@muet.edu.pk on or before November 05, 2018. Shortlisted candidates will be contacted for test/interview. The University/Center reserves the right to change the positions partially and/or wholly. The University/Center reserves the right to reject any application for any reason. Mehran University of Engineering & Technology Jamshoro, Sindh, Pakistan.